Home / Family / Children of Divorced Parents. How does the psychological effect children of divorced parents? 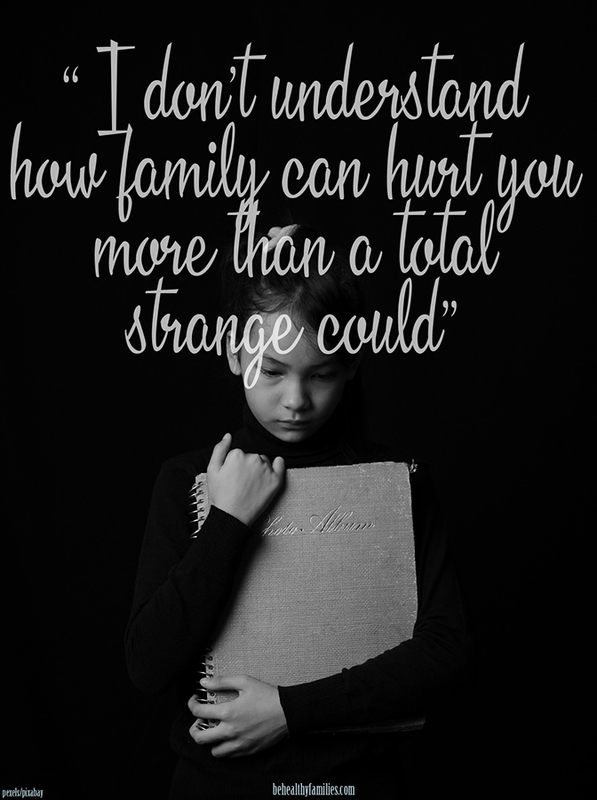 It is undeniable that children suffer the most severe psychological impact from their parents' divorce. Many divorced parents do not realize if the conflict until the divorce agreement makes the child feel intimidated. In the long term, there is an impact of psychological trauma that children suffer. 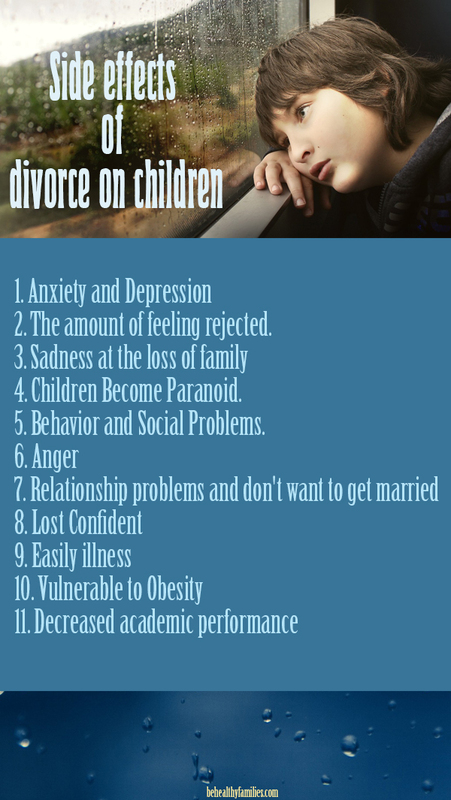 Divorce is not only a nightmare for couples but especially for their children. Children who are victims of divorce will experience psychological effects such as trauma or unstable mental conditions. They are also prone to acceptable forms of violence due to the ego of divorced parents. Divorce is the result of a parent's decision caused by a conflict that does not offer a solution to keep a married life. The decision to divorce is usually rounded and increasingly stable because of the emotions and egos of both parties. 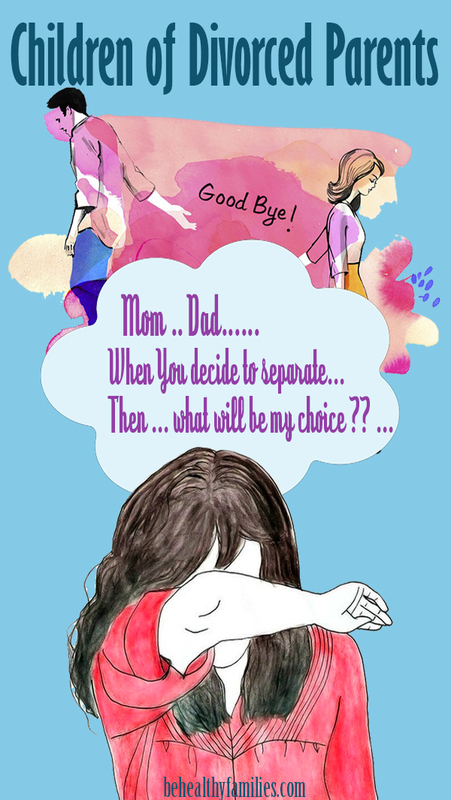 Indeed it can be said divorce is a selfish decision, after all, parents have the option to divorce, but do children have a choice? In a psychological study conducted by E. Mavis Hetherington of the University of Virginia and graduate student Anne Mitchell Elmore, most children encounter the short-term negative consequences of divorce. When his parents have just divorced, generally children will experience anxiety, anger, shock, and distrust. Another study was conducted by sociologist Paul R. Amato from Pennsylvania State University. He tried to find out the effects on children after years of divorce from his parents. So in this study researchers considered the age of the child when his parents divorced. The results of the study revealed that there were only a few differences regarding academic achievement, emotional and behavioral problems, delinquency, self-concept and social relations of children whose parents divorced and those who did not. Another study conducted by Hetherington in 1985, when a parenting conflict did not display in front of a child, the child would be surprised and might even be scared when they found out that their parents would divorce. But in children who often see their parents quarreling, it will be more open to the divorce of their father and mother. Whatever the results of the study, not everyone gets better after getting a divorce. Some even get depressed and experience anxiety disorders, so run into drug abuse. It is, of course, will trigger the lower quality of parenting which will also get worse. Admittedly, the impact of divorce on children cannot be generalized. The most important thing is if the father and mother decide to divorce, the parent needs to explain to the child the real situation. However, the best of the worst is that the child must keep in touch with his parents. It is extremely crucial for parents, even before deciding to divorce, should make an arrangement that they must hold their relationship normal because if not, the child will be the worst victim of a parent's decision to divorce. Side effects of divorce on children. Post-divorce problems will also come, especially if you and your partner already have children. You have to think carefully about the effects of divorce on children who are mostly bad for their psychological side. The child will feel that his family is no longer perfect, so that jealousy will emerge from his friends who often spend time with his parents. Children will feel deep sadness and disappointment when they find out their parents will divorce. Anxiety and Depression. One of the effects that can occur in children due to parental divorce is a change in mental condition. Children who have to deal with the parent's divorce frequently encounter anxiety, depression, and make children's emotions uncontrolled. According to the American Academy of Child & Adolescent Psychiatry, many children consider themselves to be the reason for their parents' divorce. It causes stress and pressure in them. As a result, children often think negatively and experience nightmares. The amount of feeling rejected. Children interpret parents who leave home as their refusal to be near children, and not because of problems in the marriage of their parents. This feeling will be even greater when it's time to visit parents who leave home. If they do not fulfill their promise to visit children, children will feel rejected and feel very unloved by their parents. Children will feel that parents who are with them now will do the same thing someday. They feel very helpless to improve the situation, to prevent divorce, and to "improve" the state of their parents who hurt each other. Sadness at the loss of family. For children, separation or divorce emotionally parents can be equated with the death of parents. Children not only suffer and are saddened by the loss of daily contact with one parent, and lack of contact with others but are saddened by the loss of security and well-being that they previously felt in the family. In response to this sadness, including confusion, anger, denial (not accepting reality), stress, feeling empty and helpless. Children Become Paranoid. When a parent decides to divorce, the child will risk losing self-confidence, inner calm, and losing dreams. They no longer have enthusiasm in living life. The result, they will develop into a paranoid person. This trait will make him withdraw from association in society and he will choose to hide in solitude or even become a rude person. Behavior and Social Problems. Children who are victims of divorce usually tend to feel they have no direction in life and have no supporters in their lives. They will be children who are out of control and more aggressive. They also tend to be more easily involved in the use of alcohol and illegal drugs. Anger. Children who are caught up in divorce are very angry with their parents because they only think of their interests and themselves, and place children in the midst of their conflicts. Many children experience a conflict of loyalty when they are forced to choose or to join one of their parents. Children suffer greatly because if they choose one parent, they feel betrayed or betray their other parents. Some children don't show their anger and keep it quiet in their hearts. They don't want to make their parents more upset. Every child has a difference in expressing anger, including by means of tempering (fussing and whining), aggressive behavior toward others, or feeling helpless in dealing with various situations. Relationship problems and don't want to get married. When a child grows up witnessing the failure of his parents' marriage, he becomes doubtful and does not believe in love and harmony in a romantic relationship. As a result, he became hard to believe with his own partner. Even the trauma that results from divorce will make a child avoid marriage when he is an adult. A child will feel reluctant to get married for fear of experiencing the same thing as their parents. Memories of separation, feelings of sadness, disappointment experienced when small will make an impression and make him pessimistic about the relationship between men and women. Lost Confident. The impact of divorced parents on children is one of them is that children. become insecure when in their environment. Divorce is a mental burden for children, when the other children have complete parents, while they are not. Children feel excluded from the environment because they lose social concepts like most of their friends. As a result, children begin to withdraw and close themselves, not even those who become nervous when dealing with many people. Easily illness. In addition to psychological problems, parental divorce also has an impact on children's health. Research from Carnegie Mellon University mentions that children who have divorced parents tend to experience pain more easily, especially flu. However, this turned out to be not very influential on the children whose parents still had good communication after divorce. Vulnerable to Obesity. A study at Florida State University showed children whose parents divorced could tend to be obese. Research conducted by psychologists investigated how unpredictable childhood experiences affect weight. Events such as divorce are one of the unpredictable experiences and are the biggest triggers that cause small children to eat more when they grow up. Previously, there had been studies that confirmed the clear relationship between low socioeconomic status and obesity. But no research has clearly identified the root causes. Most of the results of the study concluded that stress due to parental divorce results in a variety of negative effects on children later on. Decreased academic performance. A recent study conducted by the University of Wisconsin-Madison found that children from divorced parents often miss math compared to their classmates. In addition, their social skills are also affected by exposure to anxiety, stress, and also low self-esteem. In addition, changes that make children's lives unstable can make their minds distracted so they cannot focus. Plus, divorced parents often cannot focus on taking care of their children, because more and more things need to be done as a single parent. This condition makes it easier for them to scold or argue with children so that it can also affect children's development. What you should know: a child's feelings about your divorce. Children hope you both will remain involved in their lives. Like still sending messages, calling, visiting each other, and telling anything like children and parents. When one doesn't want to be involved, he feels ignored and unimportant. Children do not want you both to fight, what he wants is to agree with each other's opinions. Especially when you fight things related to your child, it will make him feel guilty. Children want to love you both and enjoy time together. So, keep giving support and enjoy the time with your child. Children want direct communication, not through intermediaries. When you are with him and talking about your spouse, don't tell bad things, this will make the child have hatred. Either he will side with you or even side with his ex-partner. Try to stay neutral. How to help a child deal with divorce. Explain to the child about your divorce. When divorce is just a plan, you should not need to tell your child, because this can make your child confused. When you and your partner finally really agree to separate, and one of them will leave home, then you have to explain why. Think of the time and situation right when you will say the news. You can choose when your child's emotions are not under pressure (heavy duty, school exams). When you explain to your child about your divorce, the wound may remain to be stored in the child's memory. Not infrequently there are children who become traumatized when they learn the reality of parental divorce. Selecting the time and situation needs to be done. Also prepare your mood, even though it's still not good after the breakup. Make sure you are next to the child when he feels sad and alone. Explain your separation together with your spouse. It can avoid confusion in children, and children will not only hear one version of the story. According to Paul Coleman, a psychologist, and author of How to Say It to Your Kids, quoted by the Baby Center, this can also maintain children's trust in both of you. Even when you have more than one child, do not just explain to the first child, then impose a duty on him to tell about the separation of parents to his sister. It is better to gather the whole family together so that there is no secret. Don't assume they will react like what, let them show their feelings. However, you may think of questions that might be asked by them, so that you have 'neutral' sounds to say. Understand and listen to children's feelings. When parents decide to divorce, children can feel confused, some even feel guilty, or feel parents should better understand themselves. You and your partner must try to put aside the problem at hand, and start listening to your child carefully, then give a specific response to what your child feels. Avoid conflicts in front of children. Divorce has left a wound on the child's heart. So, do not get the pressure he experienced more severe by arguing or fighting in front of him. 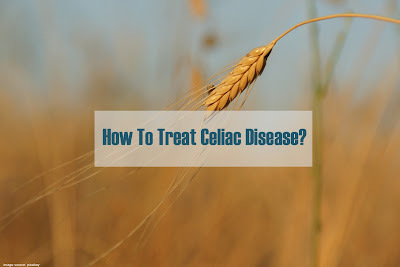 Avoid this as much as possible because it can increase stress in children. Pain will heal through feeling understood and loved. Express an apology to the child for what happened. As much as possible you and your spouse remain involved in the lives of children so that children do not feel lost attention from parents. Avoid making mistakes that can worsen the child's condition, such as complaining to children. Do not make children as intermediaries or delivery messages, especially as an outlet. It can make children hate one party. Avoid vilifying your partner in front of a child. Don't let emotions take over by telling your child about the mistakes of the spouse, financial problems, or things that corner your ex-spouse. Also, avoid arguing in front of your child. According to Rachel Sarah, a mother and author of Single Mom Seeking: Playdates, Blind Dates, and other Dispatches of the Dating World, quoted by the Baby Center website, always remember that the child is still part of his father, whatever happens, it will not change. However, divorce will still leave a wound, both for children and parents. Do not let children feel the worse impact of the condition. 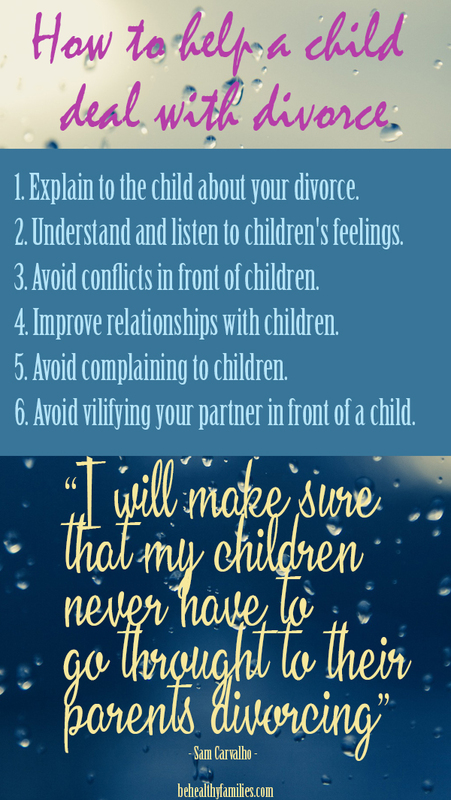 You and your partner can do the above methods to help a child deal with divorce. Also, read The impact for children: Parents Fights in front of Children.